So we will have a break from chemo, and hopefully the side effects will slowly start wearing off. I expected to have a lot of energy this week, but didn’t happen yet, so maybe next week. Since it is the second round, it may take just a little longer to get my mojo back, but it will come, so the next weeks are really something to look forward to. Whooo Hooo to being able to get the nasty taste out of my mouth, get rid of chemo burn and nose running constantly. On the art front, I got one piece juried into the Glendale Arts Council Show. Wolf Dream Catcher on Black Velvet paper, embellished with feathers, fur, leather and beads. It is a Wolf Dreamcatcher, and will be there until Sunday, Jan 24th. The show is open daily from 10Am to 5 PM. It is at Sahuaro Ranch Park, 59 Ave & Mountain View, in the old packing building just North of the main building and rose garden. If you live in the West Valley, you would really enjoy it, there are two rooms of great art. Speaking of Art, I have started a new project for the new year. Thinking of Christmas, I decided to make Hand Drawn Christmas Cards. If I do one a week , should have enough to send everyone on my Christmas list an original. 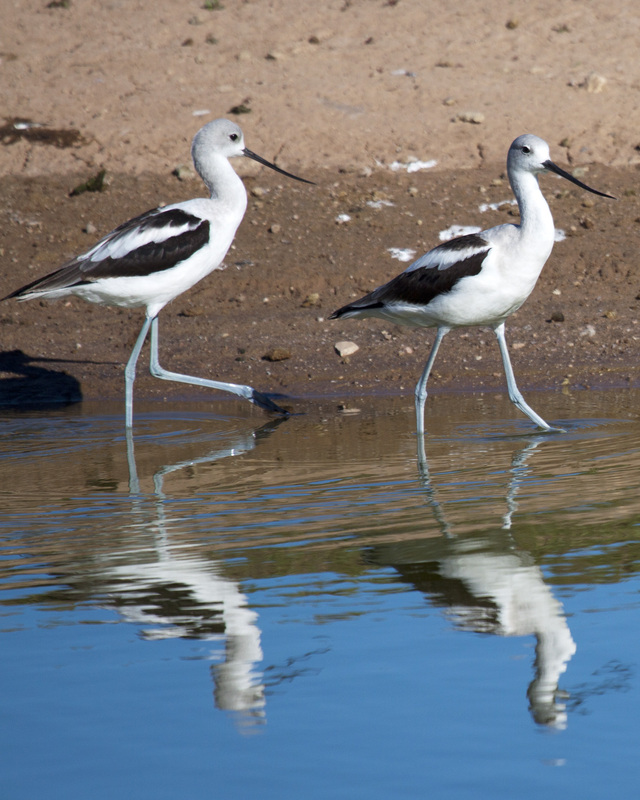 They are 5″x7″ and will pop right into a frame, or can be matted and put into an 8″x10″ frame. SO here is a sneak preview of the first four cards. It was Jan 2015, then I blinked my eyes and it is 2016!!!! Where did 2015 go? This happens every year, but it seems like it happens faster each year! I know, I have been on this soap box before, but really how come time seems speeded up and when I was young, it seemed to drag on forever. All it takes is one art project and time goes into zen mode and I wake up a few days later with a completed project. Or it is chemo week, and I sleep the week away. LOL, I guess a lot of it went by while I was sleeping. So this was the last chemo week for a while, the CEA count is down to 27 and we are praying really hard that it takes a big dive this month to get under 10. The hair is really in the baby grackle mode now, but in a few weeks it will start growing back. Speaking of hats, I was asked to post a few photos, so here they are, the latest style in chemo hats! The kitty, parrot and wild bird therapy continues, and I feel a little better every day. We are planning a Texas visit the family trip the first week in Feb, so I am looking forward to seeing everyone! George got a Weber Smoker for Christmas, so we have been treated to pulled pork and smoked brisket over the last couple of weeks. The AZ Cardinals are in the NFL playoffs, so we have some exciting times coming. Wishing you and yours a wonderful year to come! 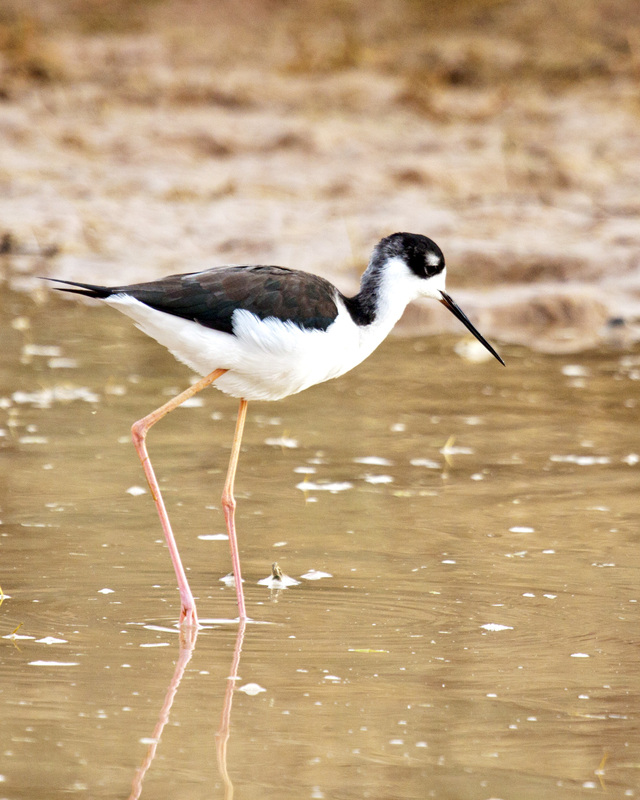 known, Joey Bird, being the second. Loki did her tour as a the star of the show of a small group of clicker trained birds. She would ride her bike, play basketball, go shopping and watch the little birds, Sunny and Charlie, would keep score and clean up the mess after the basketball game, which Loki always won. One human almost made a shot in her basket ball hoop, just missing. Miss Loki Bird also proved the superior intelligence of Macaws by answering questions pulled out of a bag. Volunteers were almost always unable to answer their question (such as: How many drops of water in the ocean? ), while Loki always knew the answer to her question (Any yes or no question, such as: Is your name Loki?) . Loki shuns the celebrity life having had so much public attention. Loki rarely goes out in public as people still hound her for autographs and the paparazzi constantly harass her. She spends her time with her previous cast, Sunny and Charlie, volunteering as a therapy bird, sunning and looking beautiful. ………Ok guys, I hear you……not so loud, the police will be coming to check on the party noise levels again……..Yes it is coming right up…….oh, you don’t want peanuts again………..Ok….what do you mean you don’t like almonds any more…….Hey you don’y have to throw the berries all over……….argh, anyone have red stain remover…..Stay Tuned! Eight chemos down and four to go!!!!! The CEA count is down to 41! So it is still working!!! Have been doing the Rip Van Winkle all week, but the news was so good, I had to wake up to let you know. Once again, I have to thank all of you for the prayers, positive thoughts and good wishes! You help me fly through this experience on wings. 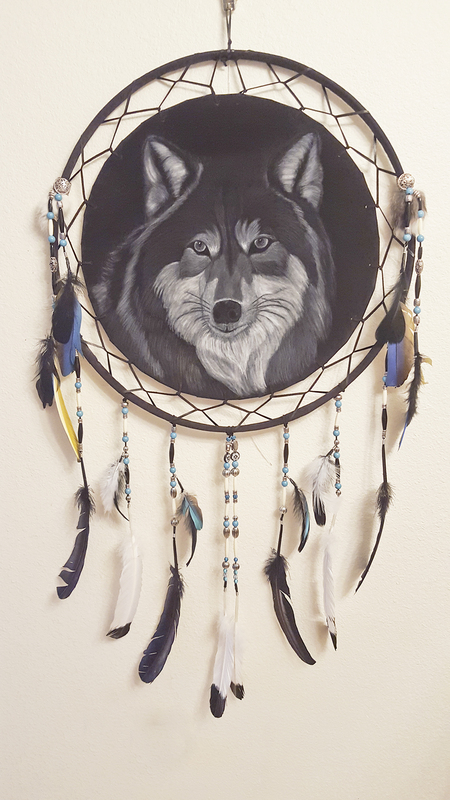 Last week was a good resting week, so I got another wolf Dreamcatcher done. Will get back with you when I wake up, now it is nighty night time again. Only five left!! Hummingbirds at the red fountain! Whoooo Hooooo…. over halfway through the second round of chemo! Five left. I did the Rip Van Winkle/Sleeping Beauty imitation from Wednesday until Saturday Afternoon. You would think I would be rested by now, LOL. 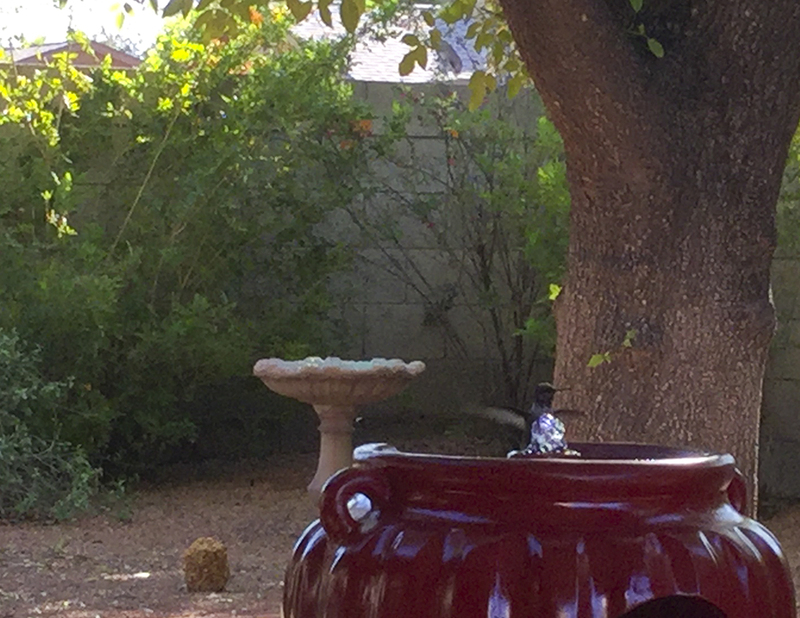 outdoors.I caught a hummingbird playing in the red fountain this morning. Only had my IPAD, so the photos are a little blurry, but you can see why we enjoy sitting out so much. This is making me tired, think I had better go join the kitties for a nap! Whoooo Hoooooo! Halfway! Only six more treatments to go! The CEA count is down to 52 from 75, so great progress this month! I have been feeling a lot better this last treatment. Little nausea and pain levels are WAY down. Just fighting the chemo burn, but can live with it when the tumor marker count drops like this.” It is working, it is working” is my mantra! Thanks again to all of you for your support, prayers, positive thoughts and good wishes! It is finally cooling off in the desert! We have had water falling from the sky, my friends tell me it is rain….even some hail. The windows are open, it is 75 degrees and fabulous! 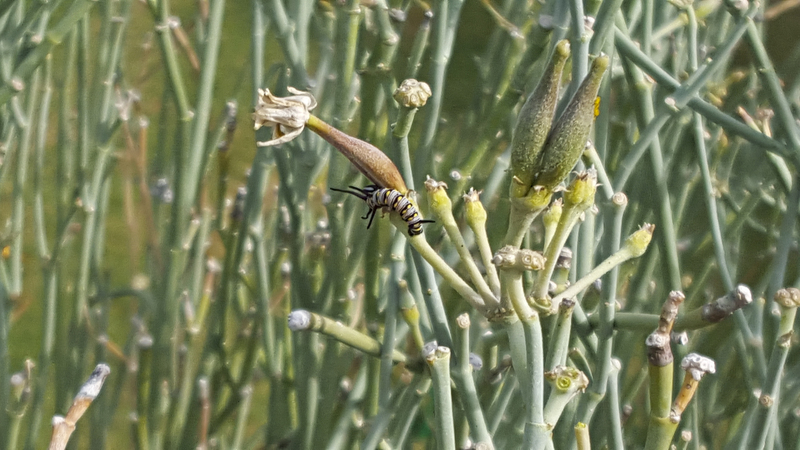 So the monarch and queens are appearing on our desert milkweed! 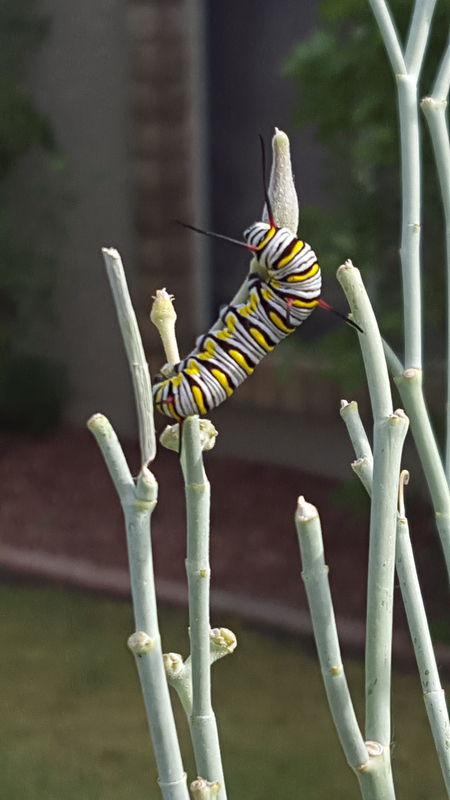 We have had three monarchs go full cycle and four or five queens, with four queen caterpillars and one monarch chrysalis still on the bush. It is our best year ever. Saving the Monarchs one butterfly at a time. Hopefully I catch one of the butterflies and post photos, but they are skittish and tend to fly when I open the door. It is awesome to see them fly away, since there are tons of flowers for them to feast on. 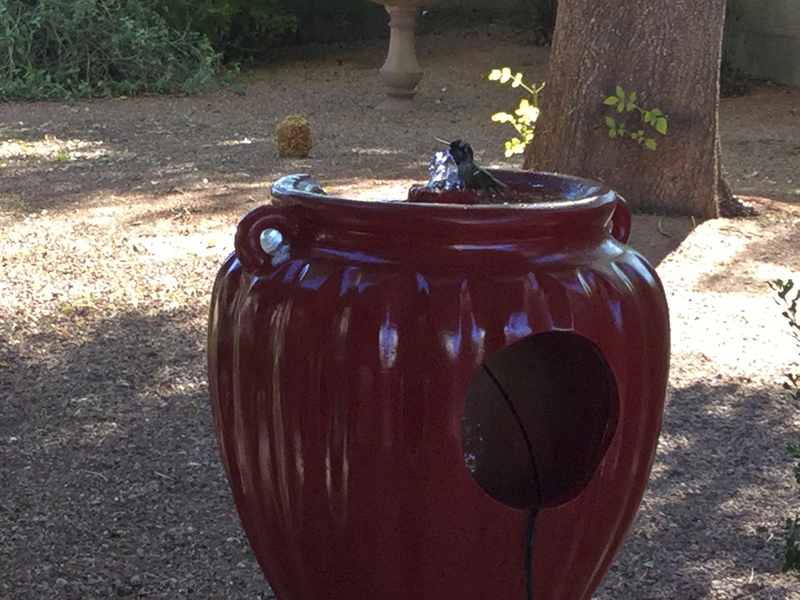 I have a new guardian hummingbird who sits in the Arizona Orange Bells just outside the door. He flies away everytime we open the door, will keep trying to get a photo! It is really hard to sneak up on these guys, I am going to have to practice stealth! I am trying to get lessons from the kitties. However, the cats are very unhappy because we are keeping them inside, except for supervised visits in the backyard. I do not want to encourage them to become bird murderers. They are very vocal about the rules at times, but the parrots just scream louder to cover up the noise, LOL. Note to self….buy earplugs. Wishing you a happy fall! Next week will be treatment #6 – halfway! Only 3 more months to go!!!! This resting week, I had a migraine Tuesday, but am feeling much better today. No nausea! Whoooo Hooooo! Back to the first New Normal, now maybe I can start having a good week in between treatments. The ole hair is thinning again, but it is taking longer this time, maybe some of it will stay. The Astivan tan is definitely back, so it looks like I have been to the tanning booth. Maybe a few field trips this week as I feel better! Art store, here I come!!! 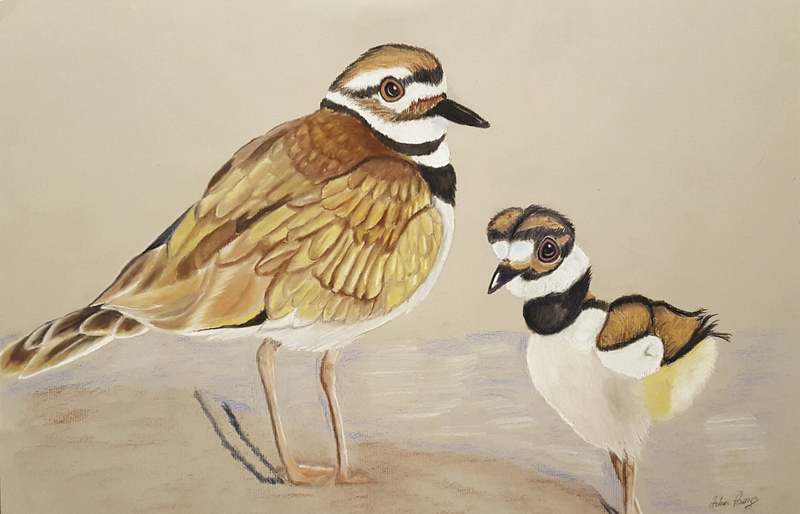 Three of my pastel pencils are down to the nub, but still was able to work on the Killdeer. Think it is about time to step away from the drawing. 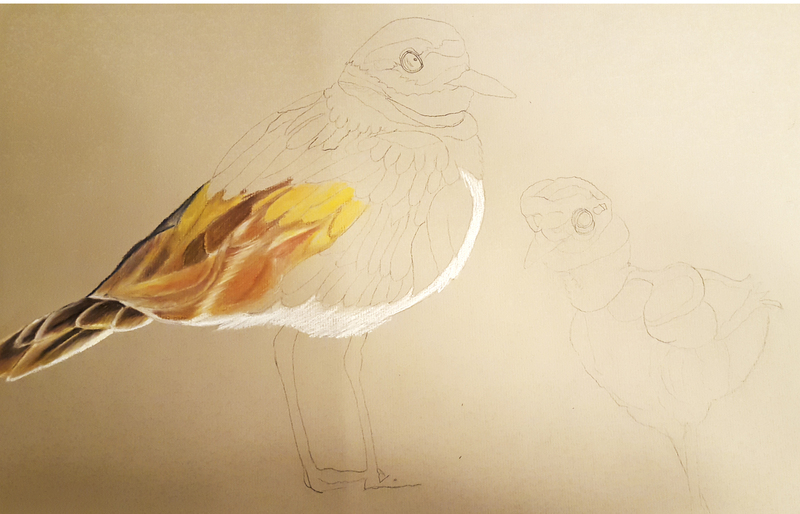 Well, maybe a few more adjustments……I love killdeer, especially the fake broken wing act the parents do to draw you away from the little ones. And speaking of little ones, killdeer just have to be one of the cutest of the baby birds, they are just little fluff balls on long legs, with the greatest expressions. Now how am I going to figure out what to work on next. I have been going through my 30,000 reference photos and it is just hard to choose. However, I haven’t done a parrot in a while, maybe I can bribe the guys to pose for me. Hopefully they have forgotten about the wages issue and will work for peanuts again. Stay tuned………. Welcome to treatment # 5 of 12……Whooo Hooooo, almost half way. Even though I have had a lot more nausea and filled a lot more barf bags it does seem like the time is going a lot faster. I had more good days last week, than I have since this round began. The CEA (tumor marker) count is still going down and was 75 at the last reading, Sept 14, down from 85 in August. Because this has been such a roller coaster ride, I got up the courage to ask the oncologist what we will have to do if the tumor marker count does not go down below ten this time. His answer was a resounding “it will” so don’t even go there. So I am happily bouncing along thinking during the nausea, the cea is going down, it is working, it is working. We are working the plan, its of good things will happen after this round of chemo! 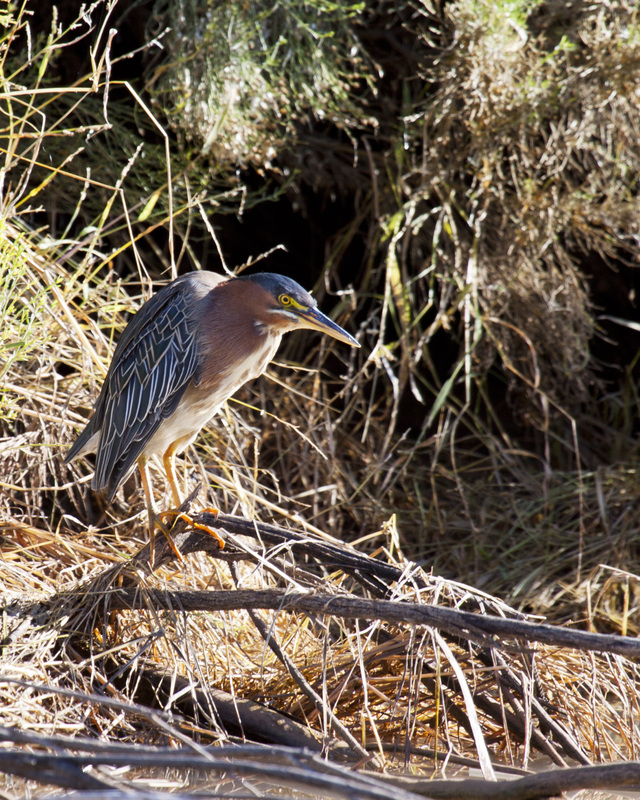 Traveling to see family, go to Alaska to photograph eagles, moose and bears, bird photo trips, more art……. This is chemo week, and I am about to Rip Van Winkle, so back to you when I wake up! Stay tuned for more bird/cat and art supply adventures. I just realized the other day, that I have survived cancer for one year, even though I am still in treatment, it has been a year. So I am going to celebrate this and continue the fight. A toast to surviving!*!*!*!*! This round has been tougher, but that means I just have to stay strong and continue the battle. Have been dealing with more nausea this time and the chemo burn has already started. Still have hair for now, and the tan is starting, so celebrate the silver linings! Thanks so much to everyone for the encouragement and support! 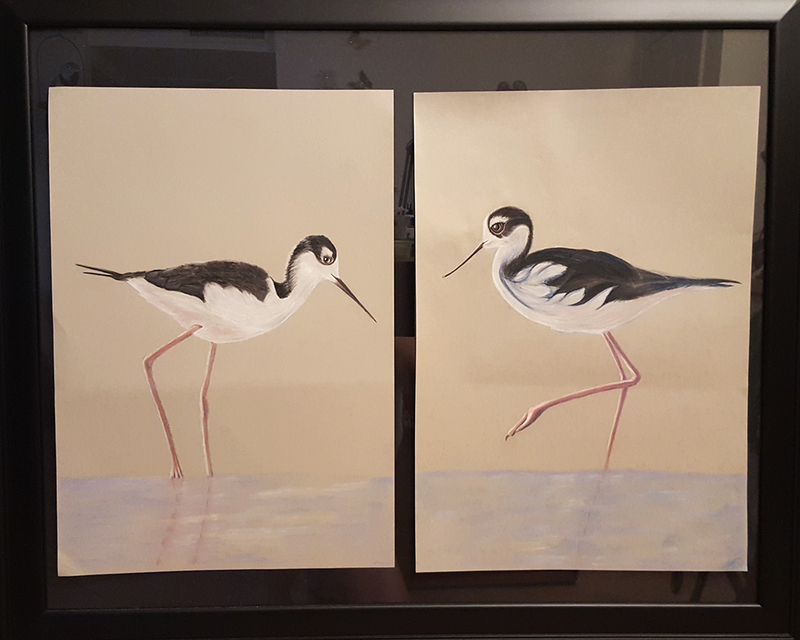 During this resting week, I have the Stilts almost done, photographed them over the “Chickadee” frame to see how they would look as a diptych. Hope you like them! Don’t forget most of my paintings are on my website, http://www.arlenepowers.com if you want to take a look around. The pastel drawings have not made it yet, but will add a section when I am feeling a little better. How do you wage a war being very cool, calm and collected when the enemy is so vicious! Cancer is cruel, it does not give 30 days notice, it causes pain, horrible side effects, death and disrupts lives. Cancer does not care….it is relentless. Normal emotions you feel when confronted with this war do not help. Denial, anger, fear, and depression can paralyze you and pull your efforts out of the war, giving cancer a battle victory. From day 1, my husband has helped me organize this War. First of all having a plan is the way to start. Fighting the unknown is scary, so we educate ourselves on the specific cancer we are fighting, and plan treatment to knock out the enemy. We take it one day at a time knowing that we are working the plan. Focus on the plan! We celebrate each goal as it is met then move on to the next goal. Build flexibility into the plan, this is real life…..So if this means missing your daughter’s wedding in Hawaii to start round 2 of chemo to win the war, you just do what you have to do and continue to put one foot in front of the other foot. Focus on the plan. Enlisting your allies in the war is another great step in winning the war. My husband is my number one ally. He is always there; if I need a hug, to shed a tear, help with any little thing and most of all, to love and to laugh. We have a great medical team, a great family & friend team, a great prayer team, a wonderful positive thoughts team, the amazing birdie and kitty team, and the awesome team”Mother Nature”. SO here we go into round two of chemotherapy. This is the stage where we hope to make THE big knock out. Twelve cycles of chemo week/ resting week. Same treatment as last round. The pain in my right hand is subsiding, so I am planning some new art works already. AND Treatment 1 of 12 is done and treatment # 2 starts next week, we are almost 1/6 of the way! Thanks to all of you for the company, comfort and support on the journey!